The Big Boss Oil-less Air Fryer is a pretty good air fryer for someone who plans on cooking most of their meals with it. The air fryer consumes very little oil and because of its clear design, it gets really easy to check on the food you have been cooking inside the air fryer. Air fryers, in general, is perhaps the best way to lose weight. This Fryer can definitely help you control your junk food eating habits as you can make healthier snacks with the air fryer. 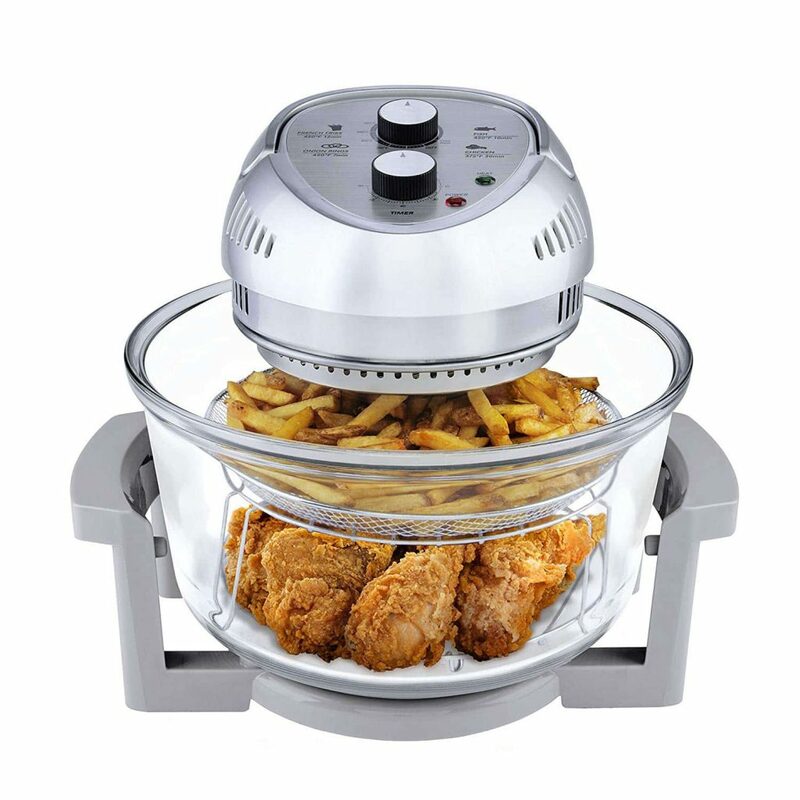 The Fryer has a huge capacity as well which means you can easily cook meals for your family in the air fryer. This way you would be making healthier eating choices without sacrificing your favorite foods while you are trying to lose weight. Most of the Air fryers that you get to see out there are usually opaque and the food is being cooked inside. 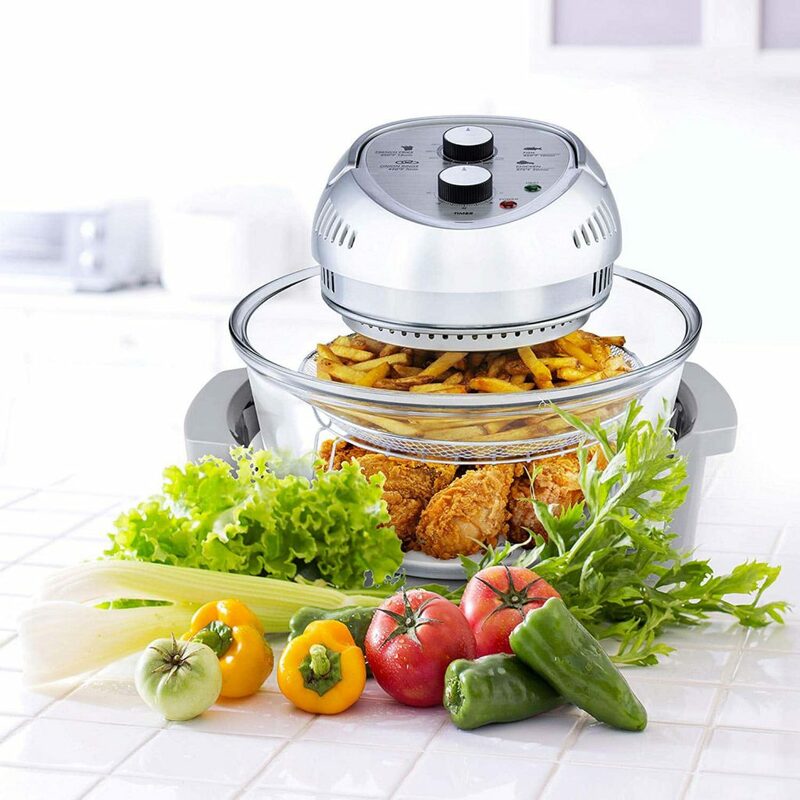 Now, with this air fryer, the transparent design helps you to see how far the food is from being done. Probably one of the best ways of cooking food as you can see if the food is getting evenly cooked, otherwise while pulling out the cooking basket to check on food, most of the air fryer lose a lot of heat. The air fryer is powerful and can easily cook food within no time. The best part about the air fryer still remains the fact that you can see the food cooking inside and since it is powerful in cooking, you may not need to turn around the food all the time. The air fryer comes in 6 different colors so you can choose to go with a neutral color or if you want a pop of color in your kitchen then you can go with the red or blue color air fryer. • The Arifryer is pretty huge and can easily cook meals for 2-3 people. The air fryer has some pre-settings which means you can cook dishes on preset timings without opening the cookbook every 5 minutes. • The Airfryer has a rack so you can choose to cook more than one dishes on the two levels. The air fryer helps you in multitasking so you can cook more than one dishes at a time. You might want to get a little used to this method as it is obvious that the food closer to the heating coil is going to get cooked faster. So, it is required that you check your food at regular intervals so that they are not overcooked or undercooked. 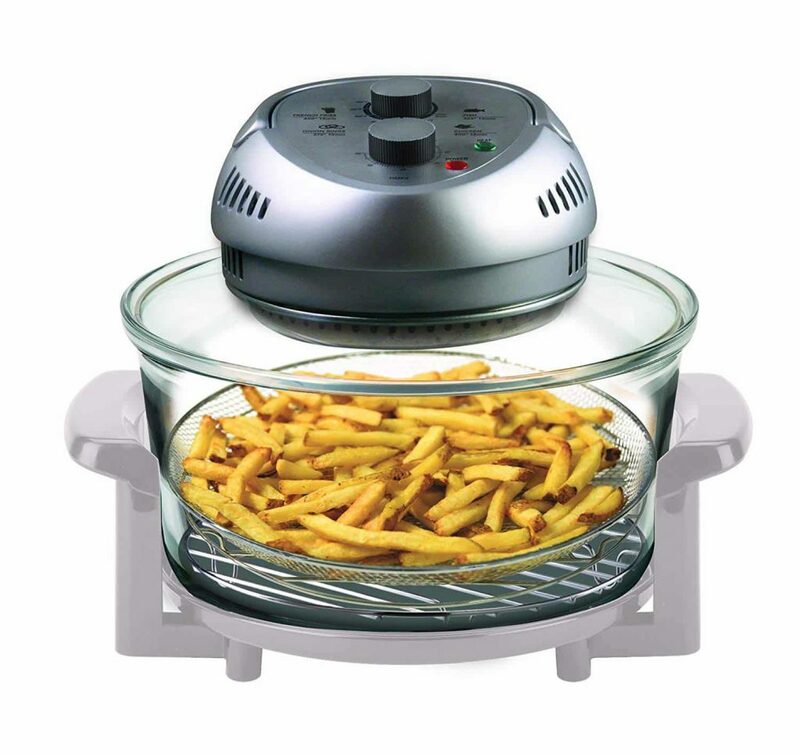 • You can even use this air fryer as a dehydrator and make your favorite dry fruits in order to put them in desserts. You can mix and match the dry fruits in order to get the perfect combination that you have desired. • You can cook, bake broil, literally cook anything inside this air fryer. The air fryer is pretty huge so you can fit a whole chicken or fish inside it. Cooking a full meal for 2 people is really easy with this air fryer, so if you want an air fryer with medium-large capacity then this one from Big Boss is an air fryer you should consider to purchase. • The capacity of the air fryer is pretty huge. It is large for the price you are paying and if you want to cook meals in an air fryer then this one from Big Boss is a perfect choice. • Many people have complained about the longevity of the product. There are many users who say that the product may not last more than a few months. Although this comes with a warranty, so you can get a replacement but if you are looking for something that is powerful, strong and would last you really long then we would definitely recommend the Philips Air Fryer. Another good recommendation would be the Farberware air fryer if you are looking for fryers of smaller size. However, if you want to go all out and buy the largest air fryer possible then you can even look into the Power Oven Air fryers. Honestly, everything is pretty okay with the Big Boss Air fryer as it does cook well and you are getting the overall fried taste that you would expect from the air fryer. The fryer successfully cooks food really well without using much oil, in the case you are making chicken wings all you have to do is spray some oil on the food basket so that the food does not stick. If necessary you might use 1 tbsp of oil and that’s all. So, you are making healthy recipes and you are going to enjoy the air fryer. The food cooked tastes good and you are not going to have any complaints about it being dried. Overall, the Big Boss Air fryer was efficient, good great food and versatile as you can cook a lot of dishes. The only problem people can have would be the durability of the product and for a few that did not work out well. So, if you are someone who is looking for a durable air fryer then you might want to consider this downside of the air fryer. The one air fryer that is all over the place these days for its excellent performance is the Philips air fryer. We can even recommend the Farberware air fryer if you are looking for a small air fryer for personal use or you can even use the Power Air Fryer Oven if you want a huge air fryer that could meet all your needs. Let us know in the comments if you have had any experiences with teh Big Boss Air fryer! If you know a friend who should get an air fryer then share this post with them on social media! !